earlier this year I finally bought a gear position indicator or GPI. wanting to be a little different and having a spare set of late model digital clocks, I thought i'd combine the two. I think it turned out ok, my only gripe is I couldn't get a neat finish around the gpi where it meets the rev counter. Last edited by bigspanishmarty; 10-15-2014 at 02:48 PM. what is that cluster off of? also, is there any chance of posting a list of parts you used? I would like to replicate this myself for my bike. Last edited by Evil_Twin; 10-16-2014 at 05:38 AM. I need to find one of those. It's not just a simple swap for an earlier model VTR. As VTR said, not a straight swap. You will need to replace cable harness if you wish to make this mod. Plus, this implies other little mods on the bike to complete the transformation from one harness to the other. that's no big deal. if I can scratch build a Volkswagen harness, I'm pretty sure a motorcycle wont be too hard. plus it'll give me a chance to clean up the old wire wrappings. and put in quick disconnects on the mirror lights and kill switches for the lights. Who will be the first to ask when these custom built harnesses will be available and what will be the sell price? When will the harness be available and how much will it cost? also, is there any chance of posting a list of parts you used? That's easy.....Dremmel and a bit of rtv/silicone. That looks really good! Was thinking about something like that until a long road trip allowed me to get familiar with speed/revs to know which gear I'm in. Still cool as all hell, tho. What indicator kit did you use? Anyone know what make the GPI is? That is a cool mod. I never felt like I needed a gpi or could figure out the use of it. I never found myself needing to know the number. Either you are in the right gear or not. If not, shift. Now temperature, THAT is where I like to see numbers. Or volts. Or even speedo digital is good. I have been looking at the three most common GPI's and HealTech did seem to be the most likely. Your answer made me look at the photos much closer. I believe you are right. I believe the model that applies to us is the X-Type. I'm assuming that you took the face plate of the tacho off? If so, how did the tacho needle come off, just the needle itself or with the shaft too? But the good thing is that my in dash gear indicator looks good! In one of the photos the OP posted, it shows the needle removed from the shaft. Me thinks you ripped it's guts out. hi guys, so for the late reply, I only pop in from time to time. it is a healtech gpi. at the time it was the smallest unit available. as for fitting, it's a case of removing the front of the dash, which is very easy, the rev needle just pops off, iirc the shaft stays in place. then remove the rev counter fascia and cut it to fit the gpi, I also trimmed down the clear plastic top section of the gpi unit, so I didn't have to cut to big a hole in the rev counter fascia. then I used a rotary tool to trim the internal plastic away from the main dash unit, fairly easy to do, just don't hit the circuit board. iirc I used a small piece of foam to sit behind the gpi before gluing it in place. then you simply refit everything. it takes a bit of time, but I think it's worth it. as for needing a gpi, well for some people you don't, but for me it was a case of two things. firstly was being in 6th gear on the motorway and trying for 7th doh!!! and more importantly, when braking hard for a tight corner or roundabout, from time to time i'd go down the gears and hit 1st, which would then lock up the rear wheel, so a very quick glance at the clocks reminds me of what gear i'm in. but do I like it and think it benefits me whilst riding....yes. if I can i'll try and find some better photo's and even a video of it. 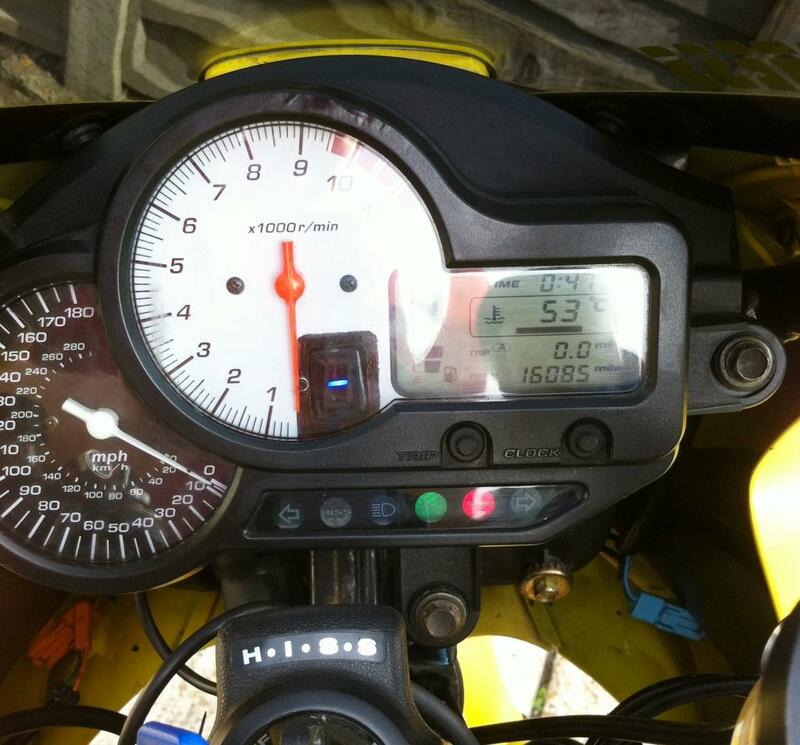 I had this feature on my last Suzuki and kind of liked it. Agree essential no, useful yes. So while I agree, riding actively, up and down gears the gear number means nothing it's in the right gear or not by power and RPM. Its that static riding on the slab, or no "feel" on the dyno that the GPI helps me. I had one on an old CB700SC and liked it. Nice mod...looks very factory.